The theme of lower than expected rate increases comes up, and the press repeats claims recent rate increases have been below expectations. That doesn't appear to be true. "Since the 2010 LTEP, electricity prices have not increased as much as they were forecast to at that time." This was true at the start of the LTEP 2013 process, but it looks false to me now after growth in the commodity rate soared since last winter. Over the next five years... residential electricity prices are expected to rise by about 7.9 per cent annually (or 46 per cent over five years). In October 2010 the year-to-date commodity charge (weighted) was 64.55/MWh, and total market charges were $85.22. In October 2013 the figures were $85.228/MWh (up 33%) and $107.28 (up 26%). Rates are up in line with LTEP 2010's projections. Reporting on LTEP 2013 notes "Ontario homeowners face a 33 per cent hike in electricity rates over the next three years..." and the same reports say that's less than expected in LTEP 2010 - with its 7.9% a year. It looks to me that the rate hikes are proceeding as expected. The 2013 "Long Term Energy Plan" (LTEP) seems to be, at first glance, a pretty tame, and possibly irrelevant, document. Any thoughts on getting Ontario's electricity market to function. A power perspective that championed the electrification of processes currently dominated by fossil fuels (including transportation and home heating). I saw none of these things. There is no recognition of the enormous cost of the Beck tunnel relative to the benefit (which has thus far been invisible); OPG is seeking an enormous rate hike now that it can start to recoup spending on that project. Simlarly, the justification for the Lower Mattagami project still eludes me as there's still no indication of what increased production will be - and without that no levelized unit cost esitmate is possible. This is concerning - particularly so as it's being held up as an example of a model project partnering with First Nations communities. I thought sanity was at work as I read there was no "need for new major transmission projects beyond those already in progress." Then I read on and found "Ontario has initiated planning that could lead to about $2 billion in transmission investments in the northwest over the long term." I had noted it would be difficult to curtail Hydro One's capital spending,, and it looks like they've zeroed in on an area to spend it. Unsurprisingly there was no mention of how little the coal capacity at Thunder Bay and Atikokan operated in recent years - but much on coversions of both to biomass and transmission galore. I think that probably makes this a good time to insert some sanity into the discussion of the Lower Mattagami project; expensive infrastructure is an investment if it stimulates growth - not if it stimulates votes, and especially not if it simply inflates the book value of Hydro One's, or Ontario Power Genertation's, equity so they can raise rates proportionately from their existing customer base (based on delivering value with the existing infrastructure). Thus the concern about ignoring markets both in analysing the recent past, and in planning capacity for the future. There's a bureaucracy industry claiming demand is unexpectedly down, and it's a key them in the selling of LTEP 2013. 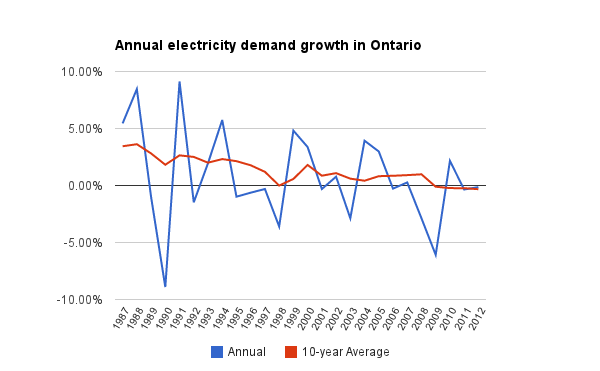 It is unexpectedly down to me - I wrote on LTEP 2010, "This should be relatively straightforward as there is a long trend (60 years) of a slowing in the increase in demand which has transitioned to a decline in Ontario..."
Demand has held right around the same level since that time. Prior to 2010 Ontario had been improving efficiency for decades.